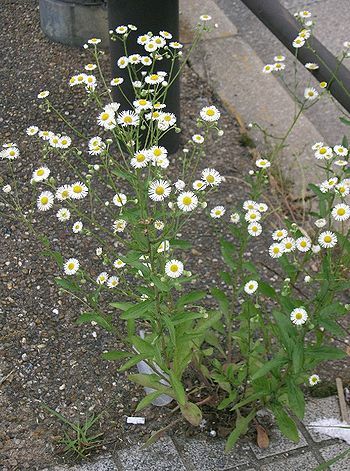 Erigeron annuus plant.en.wikibooks.org (Accessed 12/2014). Erigeron annuus is an annual herb, 30-150 cm tall, from fibrous roots (Yatskievych 2006), stem leafy, usually hairy, often branched above. Erigeron annuus leaf.copyright 2010 Gerold C. Williamson.Wild Flowers of the United States.uswildflowers.com (Accessed 1/2017). 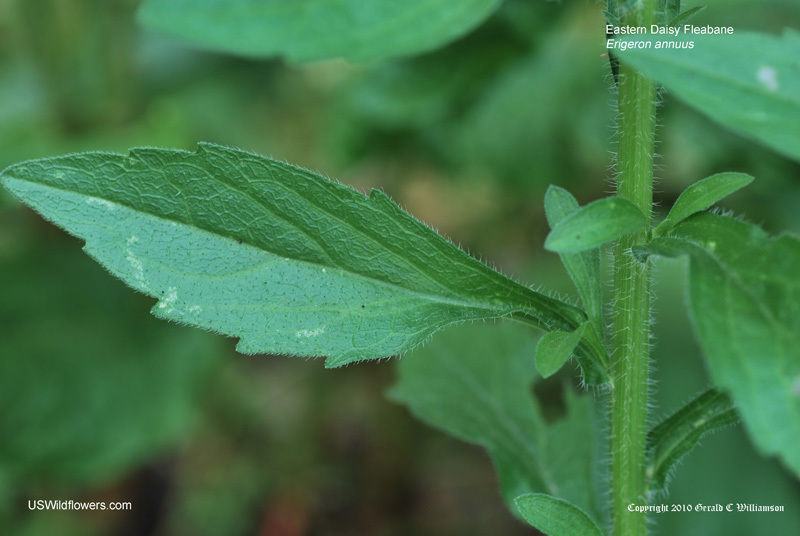 Leaves alternate, basal leaves 1.5-8 cm long, 0.3-2 cm wide, long stalked, lance- to egg-shaped stem leaves broadly lance-shaped, narrowed to base, sessile (no stalk) but not clasping stem, surfaces hairy, margins usually toothed, except uppermost. Erigeron annuus flower heads. 2006 © Peter M. Dziuk. Minnesota Wildflowers. minnesotawildflowers.info (Accessed 8/2018). Erigeron annuus (annual fleabane) backs of flower heads with bracts. 2009 © Katy Chayka. Minnesota Wildflowers. minnesotawildflowers.info (Accessed 8/2018). 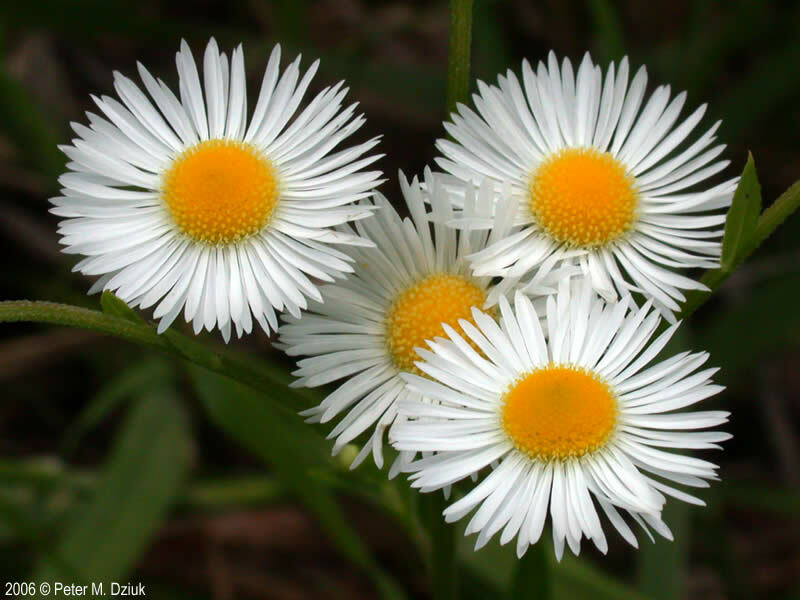 Flowers in radiate heads, rays white (rarely pink), numerous, 80-125, very slender, 0.4-1 cm long, to 0.1 cm wide (much thinner and more numerous than ray flowers in Aster), disk flowers yellow, 0.2 cm long; bracteate base of flower head 0.3–0.5 cm tall, 0.6–1.2 cm wide, bracts in 2-3 rows, the longest 0.5-0.6 cm long, 0.1 cm wide, often with a row of small, outer bracts (Yatskievych 2006; Flora of North America 1993+), finely hairy; blooms and fruits June-Oct.; inflorescence of flowers on long stalks both terminal and axillary, flower buds hairy, in dense clusters at branch tips, reproduction obligately asexual (apomictic), (Kenny 1996). Erigeron annuus (annual fleabane) fruit. 2011 © Peter M. Dziuk. Minnesota Wildflowers. 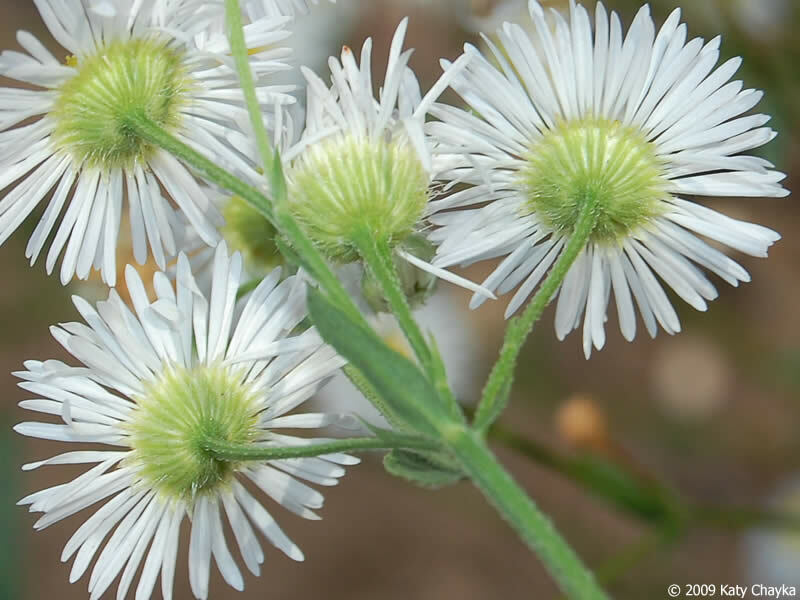 minnesotawildflowers.info (Accessed 8/2018). 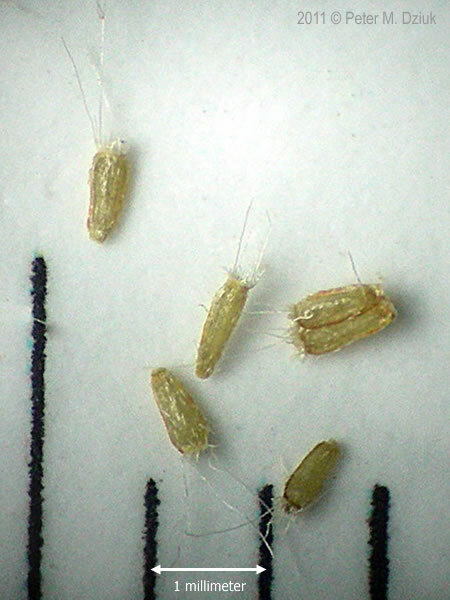 Fruit dry, 1-seeded, plumed achenes, 0.1 cm long, wind dispersed; germination in early autumn, overwintering as rosettes (Kenny 1996). Habitat: Open, disturbed areas, meadows, roadsides, fill.